"Concentration" in the summer 2008 edition of Self Realization Magazine: This essay also appears in the Journal (blog) on this Web site. Appearing in the Winter 07-08 edition of Qi Journal: My paper on the influence of Chinese philosophy on the West in the 19th century, specifically on H.D. Thoreau. "Reflections of a Western Taoist," in the Fall 2006 edition of the quarterly journal, "The Empty Vessel." For information about this Website, please click on the "About Me" tab at the top of the Navigation menu to the right. 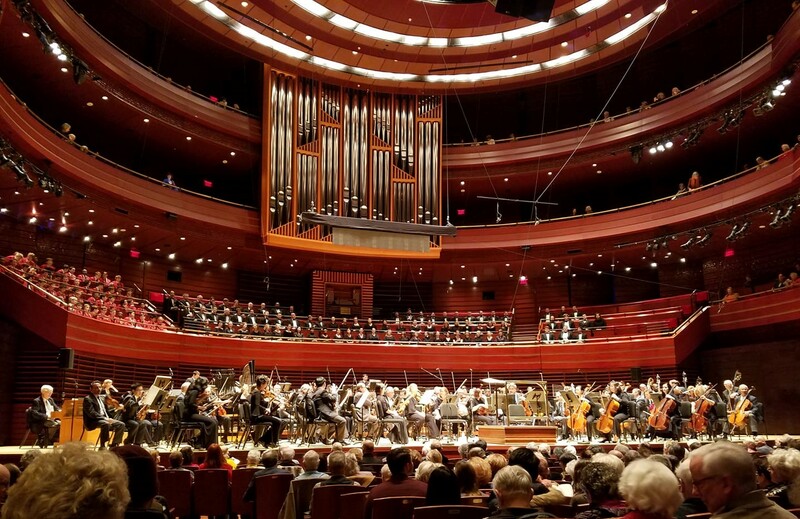 January 25, 2019--I wasn’t particularly looking forward to this weekend’s Philadelphia Orchestra concert, with its theme of Death. But the program’s two seldom-performed works belied the gloomy prospect with fiery performances and visceral passion. Yannick Nézet-Séguin and the Orchestra began the program with Leonard Bernstein’s colossal Symphony No. 3, the “Kaddish,” so named for the Jewish prayer for the dead. Bernstein’s centennial may be past, but the renewed awareness of his musical genius lingers on (two biopics about Bernstein, Hollywood’s signal that someone matters, are in early stages of production). As a composer, Bernstein was not only a master technician and stylist, but he also captured the unrest, consternation, and malaise of the second half of the 20th century in America as no other. It was fitting that his Third Symphony, hard on the heels of the Second subtitled “The Age of Anxiety,” should question the very existence of God and shout out humanity’s frustration when confronted by the pain and cruelty of existence. Conducting without a baton, Nézet-Séguin seemed to mold and sculpt the musical content of three stirring movements. Bernstein manipulates 12-tone technique to musically describe through discord our experience of heartbreak and anger. He kneads atonal chord progressions into a kind of halo surrounding a return to tonality at the end of the work. It’s an approach that could be too obvious in the hands of a lesser master, but is convincing and moving under Bernstein’s touch. Wearing a backless red sheath gown, Sierra rose like a flame in her solo passages, which included a lullaby to God delivered with tenderness, lyricism, and deep feeling. Even nearly 60 years after its composition, Bernstein’s own text is unsettling in its taunting cynicism, almost making fun of the Deity by suggesting that humanity can nurse a dying Godhead back to health. While this may seem odd to us today, it reflects the growing Angst, introspection, and egocentrism of the era (early 1960s) in which it was written. And yet, words won’t change anything. But music can “The dawn is chilly,” states the Speaker near the conclusion of the final movement, “but has come. If I die, You come with me,” she says quietly as the soundscape rises from minor to major and the entire orchestra and choirs together soar into a finale of almost unbearable exultation. Humanity’s questioning and cajoling have served their purpose. In spite of everything, we are left with a notion of splendor and hope. Gioachino Rossini is best known for his popular light operas (The Barber of Seville, Cinderella, et al.). He took early retirement in his 30s, and while his opera-writing days were over, he did turn his hand to the occasional musical composition, such as the final work on this concert, the Stabat Mater. Sometimes referred to as a hymn, a Stabat Mater is actually a form of its own, a Roman Catholic text set to music and performed as a religious or concert selection. Dating to the 13th century, the Stabat Mater text honors the Virgin Mary as she stands at the foot of the Cross. Although not as popular as some other religious narratives, the Stabat Mater has been set by a number of notable composers, including Pergolesi, Vivaldi, and Dvořák. Rossini’s version, in 10 movements, calls for orchestra, four singers, and choir. Not surprisingly, the work begins with low, melancholy passages in the orchestra and choir, painting in sound a portrait of Mary the mother of Christ, Mary Magdalene, and the disciple John at the site of the Crucifixion. In his original version of 1833, Rossini had composed only movements 1 and 5 through 9, adding additional movements a number of years later after one of those complicated legal squabbles that riddle the history of classical music. It may be the break in time that accounts for the peculiar difference in tone between the first movement and much of what follows. Not only are the second and third movements much lighter, but they have a jaunty lilt that seems to foreshadow some of Verdi’s biggest hits. In a way, encountering these tunes, which could easily have been married to racy lyrics, was as unsettling as hearing Bernstein’s Speaker hurl insults at God. The hour-long work is a bit tedious for the first 45 minutes, although musicians and singers performed impeccably. Individually and together, the four soloists crafted a series of beautifully sung solos, duets, and a quartet from the meager material presented to them. But all that changed after the Inflammatus/Day of Judgment (Movement 8). Here, Nézet-Séguin shifted into a higher warp factor at the helm of his own version of the USS Enterprise. Suddenly, we were off, and it was an unforgettable flight. Rossini, too, had a few surprises up his sleeve. Who thought he could write such a magnificent fugue as in the final movement, with a cascade of “Amen”s tumbling from the awakened Philadelphia Symphonic Choir under the direction of Joe Miller? Who indeed thought it was possible that Death would have his comeuppance on that dreary winter day? Yannick Nézet-Séguin conducted the Philadelphia Orchestra in Leonard Bernstein's Symphony No. 3 (The Kaddish) and Gioachino Rossini's Stabat Mater. Artists: Charlotte Blake Alston, speaker; Nadine Sierra, soprano; Elizabeth DeShong, mezzo-soprano; John Osborn, tenor; Krzysztof Bączyk, bass; Philadelphia Symphonic Choir under Joe Miller; Philadelphia Boys Choir under Jeffrey R. Smith. Jan. 24 and 25, 2019; Verizon Hall, Kimmel Center, Philadelphia, Pa., USA. www.philorch.org , 215-893-1999 . Linda Holt is the author of The Black Spaniard (2016) and Invictus (May 2019) and writes for the Broad Street Review. There is a wonderful Chasidic story about the child of a rabbi who used to wander in the woods. At first his father let him wander, but over time he became concerned. The woods were dangerous. The father did not know what lurked there. He decided to discuss the matter with his child. One day he took him aside and said, "You know, I have noticed that each day you walk into the woods. I wonder, why do you go there? The boy said to his father, "I go there to find God." "That is a very good thing," the father replied gently. "I am glad you are searching for God. But, my child, don't you know that God is the same everywhere?" "Yes," the boy answered, "but I'm not." The Chinese online feature magazine, sixthtone.com, published an article written in 2016 titled, "Why Taoism isn't suitable for children." I did a double-take when I saw it, and can only chalk it up to a semantical mix-up of sorts. The feature begins by suggesting that parents should not attempt to "convert" their children to Daoism. I would suggest that parents pass on their religious and spiritual views, but seldom engage in the harsh practices or "force feeding" implied by the word "convert." It has been my observation that when children are not brought up in a religious tradition, they are unlikely to embrace one when they reach maturity. (Of course, this may be the intent of the atheistic government behind this feature publication.) The other alternative is often that children without any religious training may grow up to be easy targets of extreme religions or cults. Daoism would seem to me to be an ideal religion in which to bring up children, provided the parents focused on the general concepts of balance, harmony, respect for nature, and the idea of the Dao. Many children already enjoy martial arts and healing practices which embody the Daoist philosophy. I would agree that forcing children to memorize lengthy scriptures and to embrace rigorous purification rites involving fasting and not sleeping would be a bad idea, perhaps even a form of child abuse. But the basic tenets of Daoism would form an important part of the child's personal development. The more dogmatic religious aspects (rituals, scriptures, etc.) could come later as the child matured. In answer to the question, "Is Daoism suitable for children?" I would answer a resounding, "Yes!" But without coercion and keeping to the basic concepts that will help them enjoy and appreciate life in all its richness. The priest does not turn bread and wine into the body and blood of the divine. The world already is God’s body and blood. It’s already here, there is nothing to change, to transform, or to transubstantiate. The pantheists, animists, and panentheists knew this all along. Before Socrates, Thales taught that the world is full of gods. I say, the universe is not only full of but is God. The great time bending, infinite sea of space and eternity is the body of the divine, the tides and gravitational swells its blood, and when we take a bite, our pinched myopia turns inside out. It is not the elements that have been transformed by the whisper of the priest, but we ourselves when confronted by the scope of Who we are. Is Yoga a religion? A fitness regime? A community-building exercise? A philosophy of life? It can be all of these and more. Yoga is compatible with all positive expressions of religion, or it can serve as a religion on its own. It has also been proven beneficial to those with no interest in any religion. Yoga works equally well for groups as it does for individual practice. When entered into with respect and gentleness, Yoga has been proven to be a positive force in people's lives, building self-confidence, grace, strength, health, positive attitude, and community spirit. You don't have to be an athlete or warrior to embrace this pathway to well being. Find a sympathetic teacher or a beginner-friendly instruction book and give Yoga a try. It's a way to keep summer in our lives all year long. Copyright © 2016, Linda Brown Holt. All rights reserved.